Congratulations on your election to the U.S. House of Representatives! In addition to winning your own race, you are part of something larger – the first wave of a progressive resurgence in U.S. politics. The midterm elections gave U.S. voters their first opportunity to react to the way Donald Trump has conducted himself in America’s highest office. Their verdict was an emphatic thumbs down. That’s an encouraging sign that our democracy’s antibodies are working to suppress the populist virus of demagoguery and extremism. Now that Democrats have reclaimed the people’s House, what should they do with it? Some are tempted to use it mainly as a platform for resisting Trump and airing “unapologetically progressive” ideas that have no chance of advancing before the 2020 elections. We here at the Progressive Policy Institute think that would be huge missed opportunity. If the voters increasingly are disgusted with their dissembling and divisive president, they seem even more fed up with Washington’s tribalism and broken politics. For pragmatic progressives, the urgent matter at hand is not to impeach Trump or to embroil the House in multiple and endless investigations. It’s to show Democrats are determined to put the federal government back in the business of helping Americans solve their problems. We think the House Democratic Class of 2018 should adopt this simple mantra: “Get things done.” Tackle the backlog of big national problems that Washington has ignored: exploding deficits and debt; run-down, second-rate infrastructure; soaring health and retirement costs; climate change and more. And yes, getting things done should include slamming the brakes on Trump’s reckless trade wars, blocking GOP efforts to strip Americans of health care, as well as repealing tax cuts for the wealthiest Americans. 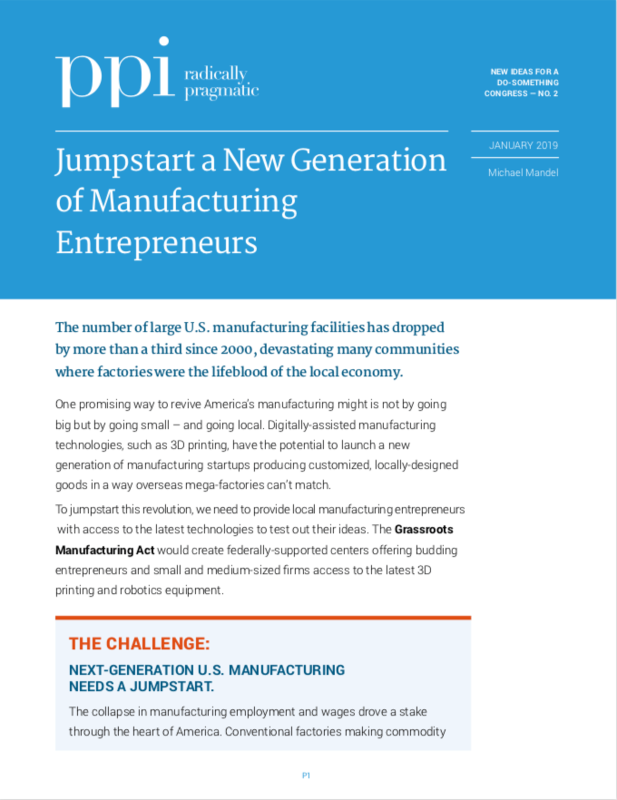 PPI, a leading center for policy analysis and innovation, stands ready to help. We’re developing an extensive “Do Something” Agenda. Today, we are releasing the first in a series of concrete, actionable ideas designed expressly for Democrats who come to Washington to solve problems, not just to raise money and smite political enemies. As you get settled into your new office, we’ll look for opportunities to acquaint you and your staff with these pragmatic, common-sense initiatives, and to discuss other ways we might be of service to you. That’s what we’re here for. First and foremost, it’s time for Congress to start doing its job on trade. A key step is enacting the Trade Authority Protection (TAP) Act. 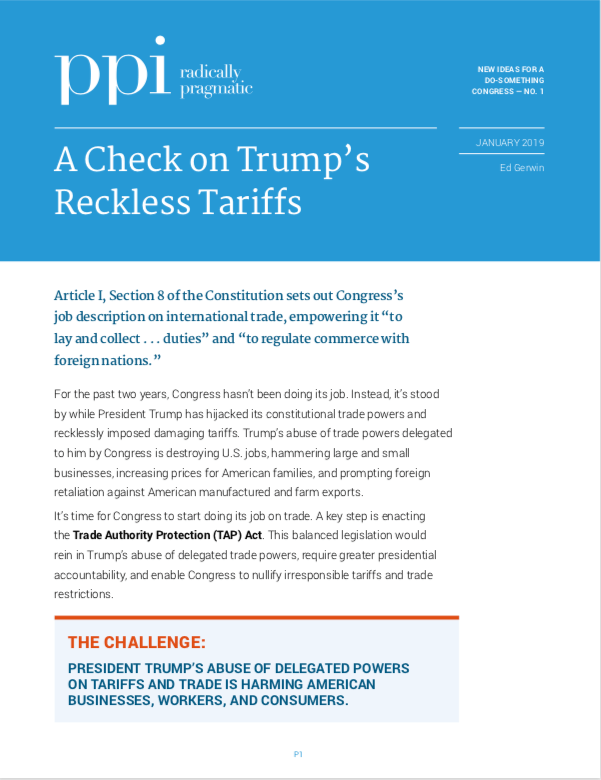 This balanced legislation would rein in Trump’s abuse of delegated trade powers, require greater presidential accountability, and enable Congress to nullify irresponsible tariffs and trade restrictions. 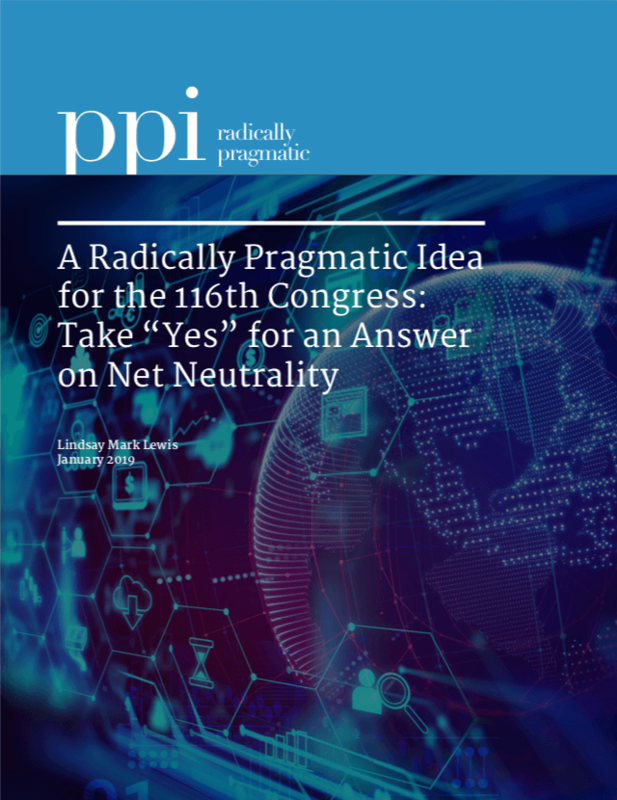 For the last two decades, different versions of net neutrality have bounced between Congress, the Federal Communications Commission, the courts – and most recently the states – but the issue remains unresolved. America’s massive health care industry faces three major challenges: how to cover everyone, reduce costs, and increase productivity. Telehealth – the use of technology to help treat patients remotely – may help address all three. Telehealth reduces the need for expensive real estate and enables providers to better leverage their current medical personnel to provide improved care to more people. Despite its enormous potential, however, telehealth has hit legal snags over basic questions: who can practice it, what services can be delivered, and how it should be reimbursed. As is the case with any innovation, policymakers are looking to find the right balance between encouraging new technologies and protecting consumers – or, in this case, the health of patients. Telehealth policy has come a long way in recent years, with major advances in the kinds of services that are delivered. Yet a simple change in Medicare policy could take the next step to increase access and encourage adoption of telehealth services. Currently, there are strict rules around where the patient and provider must be located at the time of service – these are known as “originating site” requirements – and patients are not allowed to be treated in their homes except in very special circumstances. 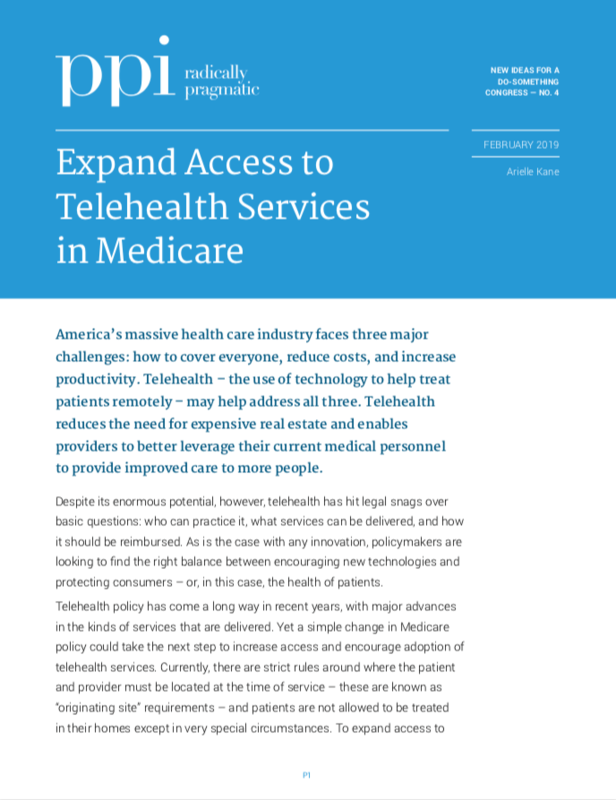 To expand access to Telehealth, Congress could add the patient’s home as an originating site and allow Medicare beneficiaries in both urban and rural settings to access telehealth services in their homes. As many as 41 million Americans live in “higher education deserts” – at least half an hour’s drive from the nearest college or university and with limited access to community college. Many of these deserts are in rural America, which is one reason so much of rural America is less prosperous than it deserves to be. 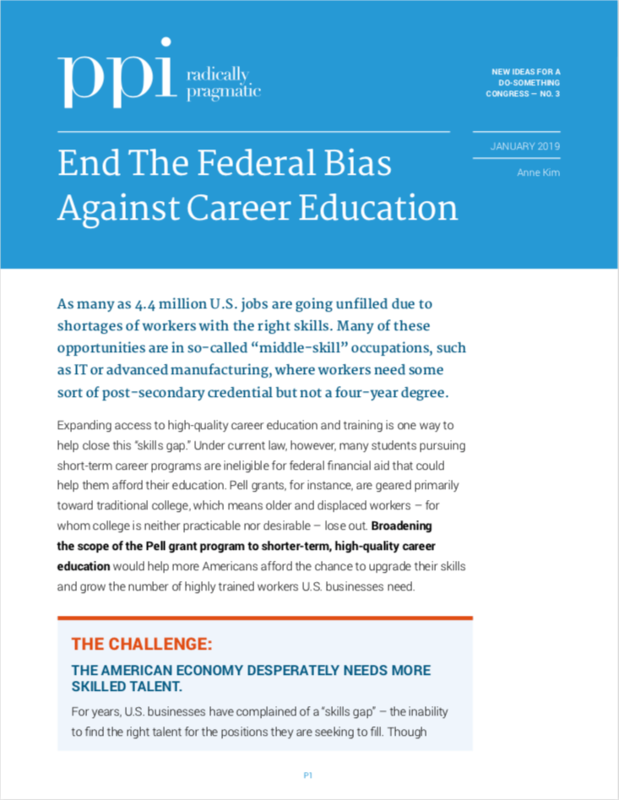 The lack of higher education access means fewer opportunities for going back to school or improving skills. A less educated workforce in turn means communities have a tougher time attracting businesses and creating new jobs. Congress should work to eradicate higher education deserts. In particular, it can encourage new models of higher education – such as “higher education centers” and virtual colleges – that can fill this gap and bring more opportunity to workers and their communities. Rural higher education innovation grants are one potential way to help states pilot new approaches. Regulation plays a critical role in refereeing competition in a free market economy. But there’s a problem: Each year, Congress piles new rules upon old, creating a thick sludge of regulations – some obsolete, repetitive, and even contradictory – that weighs down citizens and businesses. In 2017, the Code of Federal Regulations swelled to a record 186,374 pages, up 19 percent from just a decade before. PPI proposes a Regulatory Improvement Commission (RIC), modeled on the highly successful Defense Base Realignment and Closure (BRAC) process for closing obsolete military installations. Like the BRAC process, the proposed RIC would examine old rules and present Congress with a package of recommendations for an up-or-down vote to eliminate or modify outdated rules. Jumpstarting U.S. production and purchase of Electric Vehicles (EVs) would produce an unprecedented set of benefits, including cleaner air and a reduction in greenhouse gas emissions; a resurgence of the U.S. auto industry and American manufacturing; the creation of millions of new, good, middle class manufacturing jobs; lower consumer costs for owning and operating vehicles; and the elimination of U.S. dependence on foreign oil. U.S. automakers are already moving toward EVs, but the pace of this transition is lagging behind our foreign competitors. A dramatic expansion of tax credits for EV purchases could go a long way toward boosting the U.S. EV industry as part of a broader agenda to promote the evolution of the transportation industry away from carbon-intensive fuels.